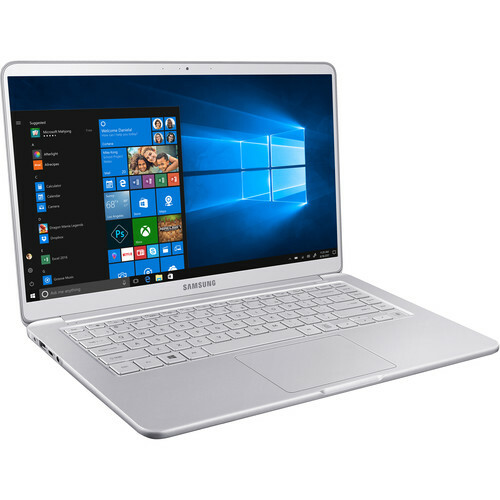 The 13.3" Laptop 9 from Samsung is a thin and light system designed for the on-the-go user. It features a 13.3" 1920 x 1080 display, driven by integrated Intel HD graphics, and has a 350 nit brightness rating with a peak of 500 for outdoor use. Moreover, it can recline to 180° so you can easily share what's on your screen. Specs-wise, it's powered by a 1.6 GHz Intel Core i5-8250U quad-core processor, 8GB of DDR4 RAM, and a 256GB NVMe PCIe SSD. If you need more space, you can connect external storage solutions using its USB ports as well as its microSD card reader. Other integrated features include 802.11ac dual-band Wi-Fi, Bluetooth 4.1, an HDMI port, a backlit keyboard, a microphone, speakers, and a fingerprint reader. The operating system installed is Windows 10 Home. The Laptop 9 features a full metal frame and magnesium alloy construction for durability that's also portable. It weighs just over two pounds and easily fits into your bag or backpack. With a USB Type-C port, the Laptop 9 can be charged via a compatible battery pack for convenient power on-the-go. Aside from the Full HD resolution, the Laptop 9's display can also reach a 500 nit brightness rating for outdoor use. Moreover, it supports 95% of the sRGB color space and has a deltaE rating of less than 2.5, ideal for color-sensitive work. A built-in far-field microphone lets the Laptop 9 pick up audio clearly. You can also use the optional Voice Note software to add bookmarks to your audio recordings. A built-in fingerprint reader lets your quickly, easily, and securely log into your notebook. The Laptop 9 has a backlit keyboard, which lets you work in challenging environments such as dark or dimly lit settings. Box Dimensions (LxWxH) 13.6 x 9.6 x 2.8"
13.3" Laptop 9 is rated 5.0 out of 5 by 4. Rated 5 out of 5 by RealHusker from Notebook 9, 13.3, 8th Gen i5 Having purchased this light little laptop very recently I cannot comment on performance over time; however, I am most pleased with this agile machine. It is fast to boot up and quick to respond to my clicks. I have had no issues with its performance. I did have a little difficulty with sidesync connecting to my s8, but after using the Samsung support button it was taken care in about a half-hour and now I can use that feature, which is something I wanted, without issue. It was worth the bother to make sure that it works as intended. The screen is very beautiful and bright as one would expect on a Samsung computer. The back lit keyboard is perfect as well as the keyboard's response. As I understand it, last years version received low marks on the keyboard, but I find its response spot on and can only assume that this issue was addressed with this model. The touch pad is very responsive and I enjoy it so much that I will forgo my intended plans of connecting a Bluetooth mouse. The case is very nice but understated . I did mention this laptop is light, which it is, but it dose not feel too light or flimsy in any way. To say that it does is simply an individual's subjective opinion, and it is one that I find without merit. I love the weight of this computer, I placed it in my briefcase today and was so happy to be freed from the heavy wight which once occupied the same space. At this point in time, I give this wonderful little computer a 5 star rating. It is what I hoped it would be out of the box, and I am most pleased. Rated 5 out of 5 by RithaB from Lightweight This is my second Samsung and I love it!! I used it for school and when I graduated, it was still ideal for everyday use, browsing, shopping, etc. Battery life is off the chain! Rated 5 out of 5 by Daniel from compact, really light, fan-less, bright, and fast I have 2 older models of notebook 9 to compare to. This ones battery is definitely a huge improvement over the older models, but no where near 20 hours. May be 10 hrs. Screen is not anti-glare, a disappointment. A lot of bloatware, but most of them can be uninstalled. Had issue of not able to view iphones .heif photos, had to install something else to view.